The young boys of Midland need your help! The Greater Midland Football League (GMFL) is dedicated to providing an organized tackle football league for the youth of Midland County. Hundreds of youngsters each year are given the opportunity to learn the game of football, get physically fit, and stay involved in productive after-school activities with local adult mentors. The GMFL also provides youth football participants with safe and accessible places to play as well as programs and initiatives that address the importance of proper coaching, academics, health and safety and life skills development. 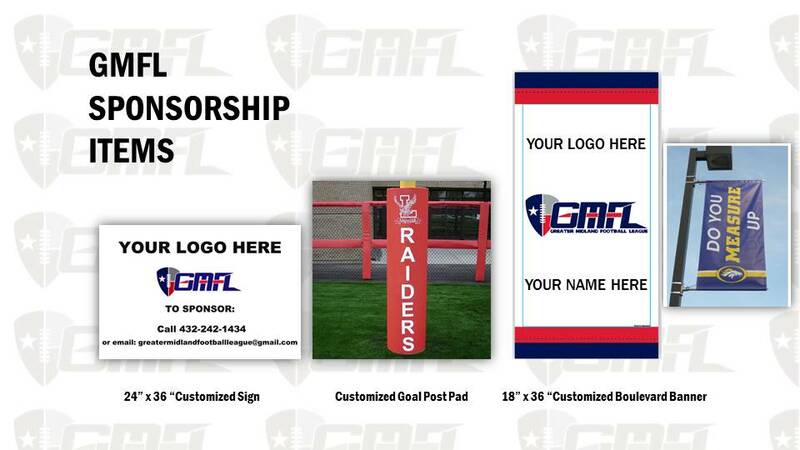 Please send a gift today to the Greater Midland Football League. From these funds we draw the monies needed to promote our service to the young boys in Midland County. We coach, teach, inspire, support and provide leadership to all young men in the grades 3rd through 6th that attend school in our county. We encourage them to succeed through positive techniques and learn invaluable skills they will carry with them the rest of their lives. Your donation will ensure that we can maintain the positive qualities of our program that we provide to the young boys throughout our community. At this time GMFL is not a 501(c)3 charitable organization.